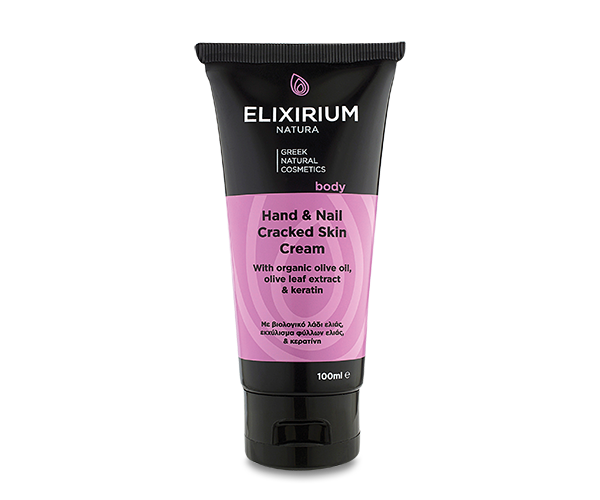 ELIXIRIUM NATURA - HAND &NAIL CRACKED SKIN CREAM. 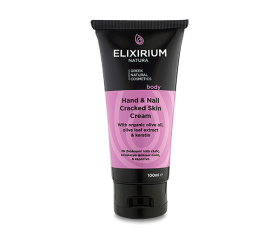 HomeElixirium NaturaBODYELIXIRIUM NATURA - HAND &NAIL CRACKED SKIN CREAM. With organic olive oil, olive leaf extract and keratin. 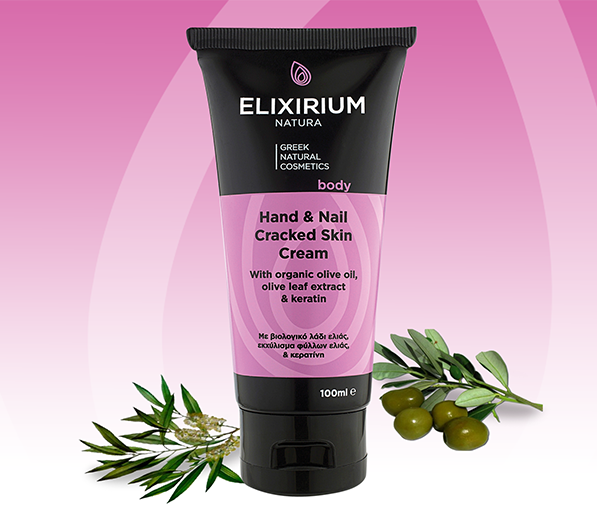 Moisturizing and restorative hand and nail cream with organic olive oil for extra – hydration. With olive leaf extract which has anti-aging properties and keratin that nourishes and hardens nails helping them to restore their softness and silky texture. Use: Apply to the hands as often as needed. Συστατικά/Ingredients : Aqua, Ethylhexyl Stearate, Glycerin, Glyceryl Stearate, Cetyl Alcohol, Urea, Trilaureth-4 Phosphate, Caprylic/Capric Triglyceride, Olea Europaea (Olive) Fruit Oil, Cyclopentasiloxane, Distarch Phosphate, Prunus Amygdalus Dulcis (Sweet Almond) Oil, Dimethicone, Ammonium Acryloydimethyltaurate/VP Copolymer, Phenoxyethanol, Imidazolidinyl Urea, Betaine, Keratin Amino Acid, Sodium Chloride, Allantoin, Panthenol, Ethylhexylglycerin, BHT, Polyacrylamide, C13-14 Isoparaffin, C9-11 Pareth-6, Parfum (Fragrance), Olea Europaea (Olive) Leaf Extract, Benzyl Alcohol, Sodium Benzoate, Potassium Sorbate, Eugenol, Benzyl Salicylate, Lilial, Linalool, Citronellol, Hexyl Cinnamal, Limonene, Alpha-isomethyl ionone.